Camerons Cottage is in the village of Foyers on the B852. The cottage is situated on the outskirts of the village of Foyers midway down the southern shore of Loch Ness in the Highlands of Scotland. The nearest shop/P.O. 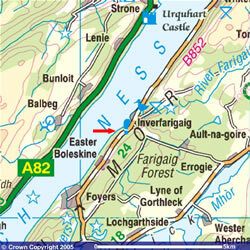 and cafe is in the village of Foyers - about 1/2 mile walk.It is 16 miles from Inverness - capital of the Highlands - and a similar distance from Fort Augustus - a bustling village at the most southern end of Loch Ness. Centrally situated so that one can make trips to the west coast - Skye, Plockton, Ullapool etc., and also travel up the east coast to JohnO'Groats, Castle of Mey, Dunrobin Castle and the farthest point north on the Scottish mainland - Dunnet Head - returning home comfortably on the same day.